While attending a very enjoyable college basketball contest at St. Francis University in Brooklyn on Tuesday night, I told my friend Eddie that I would be interested in seeing other games in the area. Eddie is a true NCAA hoops aficionado with over 125 venues visited and an encyclopaedic knowledge of the 32 conferences. He immediately mentioned Stony Brook, a university on the far reaches of Long Island known more for academics than athletics. 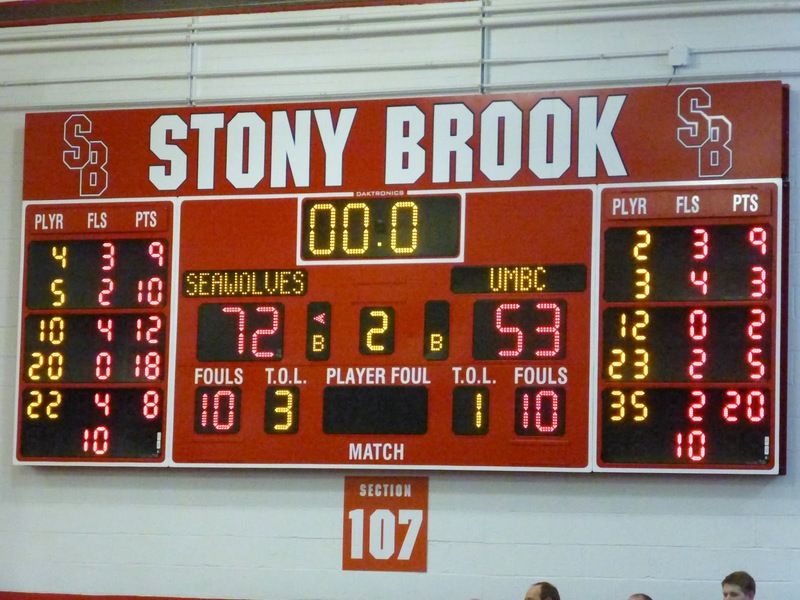 The Seawolves play in the America East Conference and were hosting UMBC (that's the University of Maryland-Baltimore County, my bit of learning for the day) on Wednesday. The big attraction was a bobblehead giveaway, with the mascot Wolfie the honouree. Getting there from New York is not that simple. You need to take the Long Island Railroad from Penn Station or Woodside and switch at Jamaica for a train going to Port Jefferson. Stony Brook is the penultimate stop on this line, and it is about 90 minutes from Woodside, with a peak ticket around $17 (off-peak is $12). From Stony Brook station, a small path takes you to campus and the athletic complex is the first building you will see, right next to the football field. Inside is a large hall with a concession stand (avoid this and try the student cafeteria a couple of buildings over) and ticket booth ($14 for reserved seats). From here you walk into the gym, which has seating areas on all four sides. 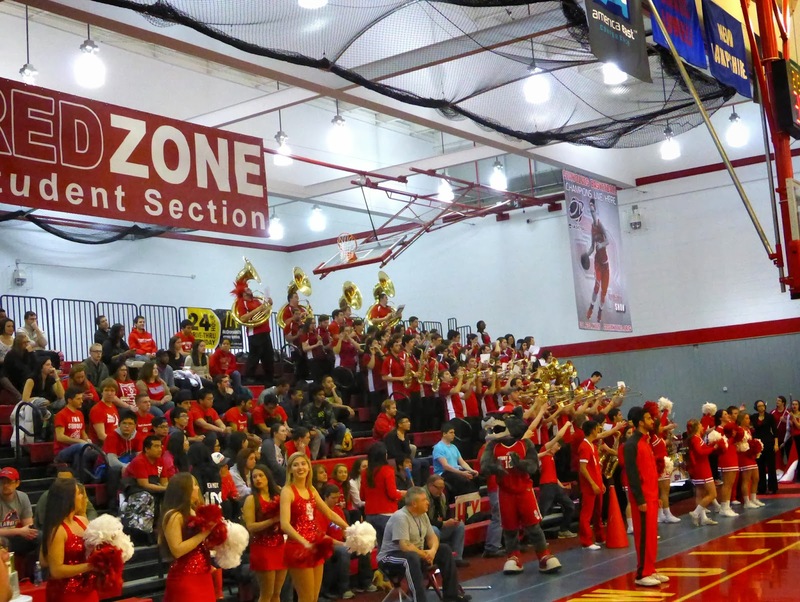 Stony Brook has an enrolment of nearly 25,000 but they are mostly there to study, judging from the relatively small student section at Pritchard Gymnasium, which is soon to be replaced by the Stony Brook Arena. In fact, this was the second-last game to be played here as the new arena will open for the 2014-15 season, necessitating another visit. My seat was in the third row behind the visiting bench, which was a great location to watch the Retrievers' coaches and players interact. There were some pretty nifty plays as well, as you can see below. Stony Brook was slow to start, allowing UMBC a quick 8-0 advantage and not scoring their first actual field goal until 8:09 had passed. Despite this, it was clear that UMBC was outmatched as they were fouling on what seemed like every play, allowing the Seawolves to remain close. 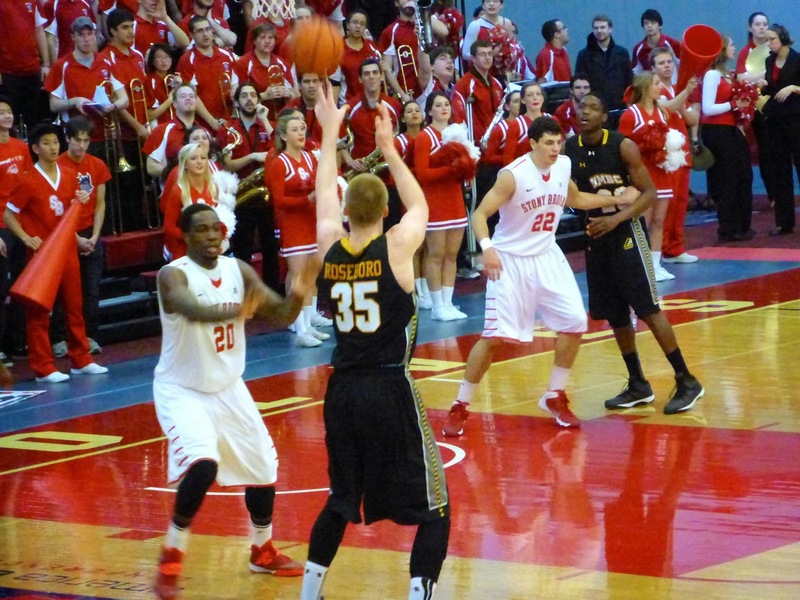 After the Retrievers took a 16-14 lead with 9 minutes to go, Stony Brook finished the half on a 21-7 run. 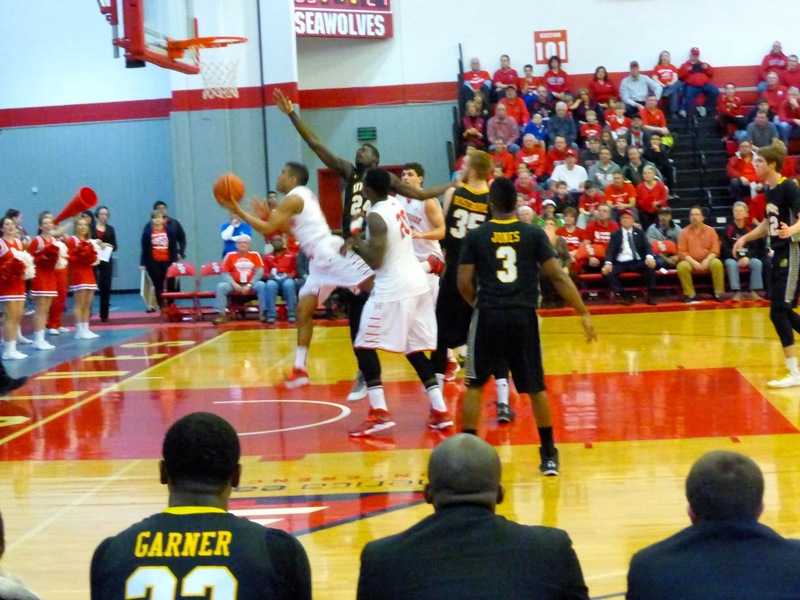 The second period was more of the same, with the Seawolves outscoring UMBC 37-30 to win handily. By the way, if you want to look at the scoreboard, avoid section 107. The game was marked by 42 fouls resulting in 47 foul shots which destroyed any flow that might have developed. 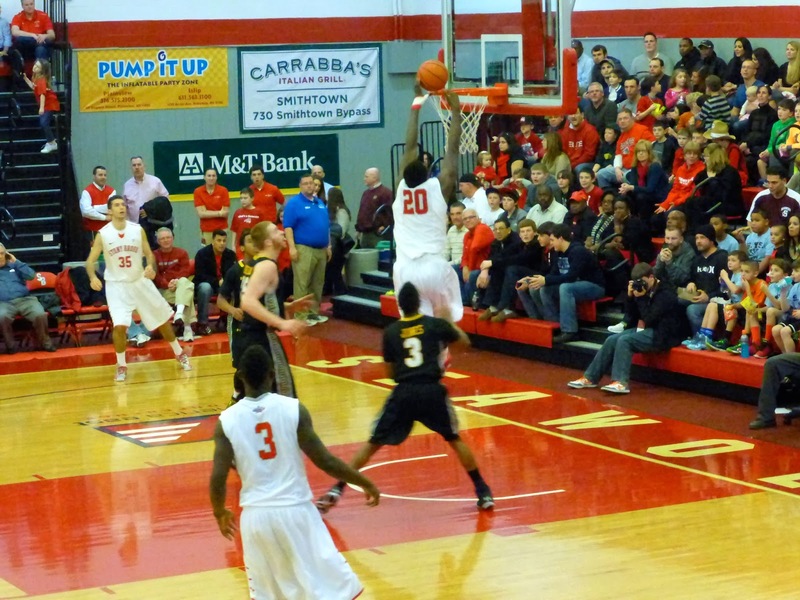 The player to watch here is Jameel Warney, a 6-8 sophomore whose 64.1% from the field ranks 5th in the nation. That's him below almost missing an easy dunk, fortunately the ball bounced in for 2 of his 18 points on the night. UMBC big man Brett Roseboro (#35 below) was their best performer finishing with a career high 20 points on 8/15 shooting. 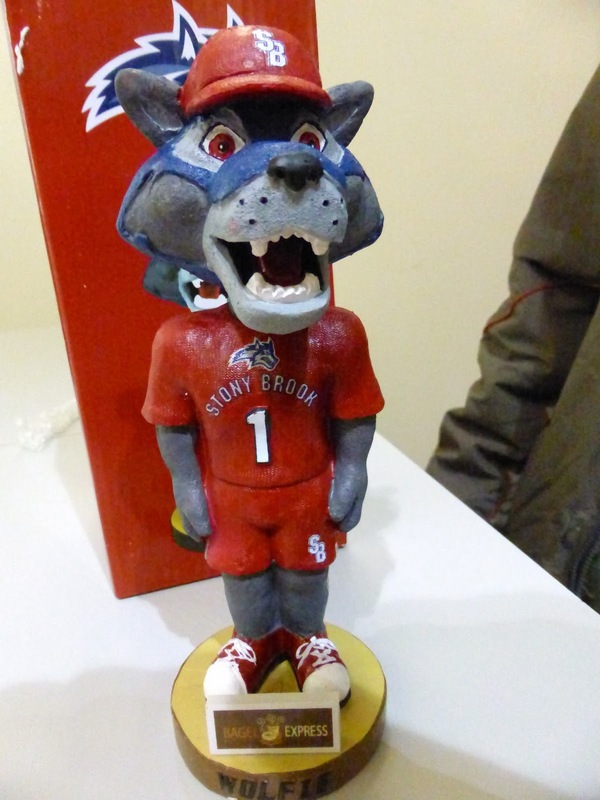 Stony Brook won every statistical battle on the night and are certainly worth watching in the upcoming America East tournament. Compared to the game the previous night though, this one wasn't that exciting. Too many whistles and a rout left me less than impressed. I'm still trying to add college basketball to the list of sports I follow, but games like this one will make it difficult. That won't stop me from trying a few more though, as I'll be visiting Columbia who host Ivy League leaders Yale on Sunday afternoon. Check back next week for a recap.